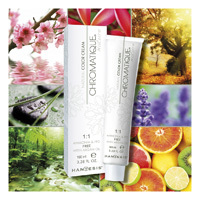 CHROMATIQUE NATURE is a permanent hair color without ammonia and without P- Phenilendiamine for a natural color, bright and long lasting. The absence of ammonia helps to reduce the risk of respiratory allergy and limits the sensitivity of the skin. The absence of P- Phenilendiamine makes the staining more gentle on the skin and less aggressive on the hair. 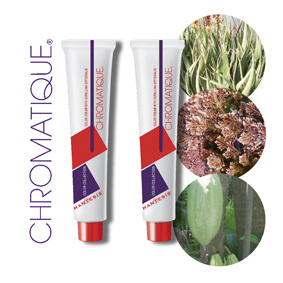 CHROMATIQUE NATURE lightens up to 3 levels of tone, guaranteeing perfect coverage of white hair, does not stain the skin and is easily removed. The formula is enriched with argan oil and natural extracts of Witch Hazel, Plantain, Chamomile, Birch, Horsetail, Horse Chestnut St. John's Wort and favoring the nourishment of the hair and place an emollient, moisturizing, toning and stretching, as well as improving natural brightness of the hair. Argan oil due to its strong antioxidant, emollient and moisturizing restructures the hair and makes it shiny. Chamomile is a natural anti-bacterial and soothing. The Birch invigorates and revitalizes the scalp, helping to prevent hair loss. The Hamamelis stimulates the formation of the epithelium by activating microcirculation, antiseptic and astringent. Shades 38 shades available : 1.0 BLACK, DARK BROWN 3.0, 4.0, BROWN, LIGHT BROWN 5.0, 6.0, DARK BLONDE, BLONDE 7.0, 8.0 LIGHT BLONDE, BLONDE 9.0, 1.1 BLACK BLUE, BROWN ASH 5.1 & sbquo, 6.1 DARK BLOND ASH, ASH BLOND 7.1, 8.1 LIGHT ASH BLOND, GOLDEN BROWN 4.3, 5.3 GOLDEN BROWN, DARK GOLDEN BLONDE 6.3, 7.3 GOLDEN BLONDE, LIGHT GOLDEN BLONDE 8.3, 4.8 TOBACCO BROWN, LIGHT BROWN TOBACCO 5.8, 6.8 DARK BLONDE TOBACCO, TOBACCO BLOND 7.8 and 3.15 DARK CHOCOLATE, 5:15 IRISH COFFEE BROWN RED 5.6, 7.6 BLOND RED, DARK BLONDE COPPER 6.4, 7.4 COPPER BLONDE, DARK MAHOGANY 4.5, 6.5 LIGHT MAHOGANY, BROWN PURPLE 2:26, 4:26 pLUM, ANTI 0:12, GREY 0:11, 9:23 lICORICE, 10:23 cINNAMON, 6.2 mYRTLE, 4:56 karkade. method of use : 1:1 mix.